Despite not being able to wrestle at the show, Rey Mysterio appeared at Strong Style Evolved last night and promised to still make his in-ring debut for New Japan Pro Wrestling. 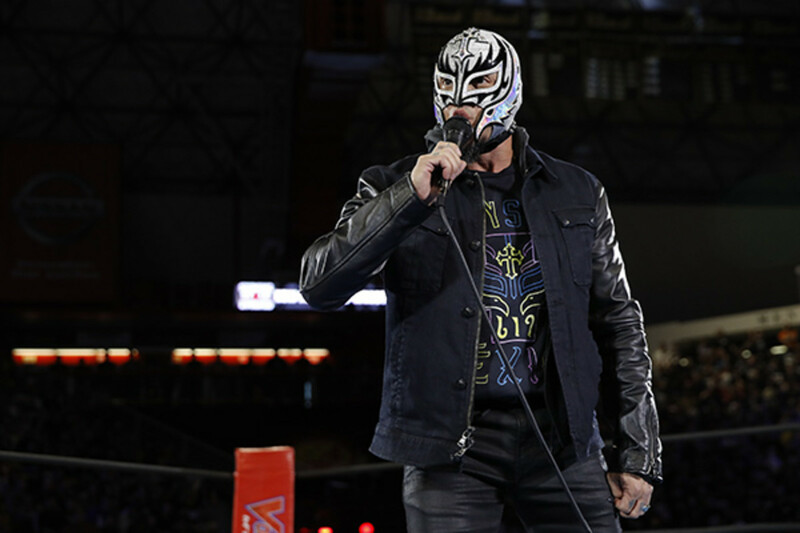 Mysterio apologized to the fans after his bicep injury kept him from facing Jushin Thunder Liger, but he said that doesn't mean the match won't happen at some point. He gave his word that he will come back when he's healthy and wrestle in an NJPW ring, calling it something that's on his bucket list. Will Ospreay got on the mic after defeating Liger and issued a challenge for Mysterio to face him in an IWGP Junior Heavyweight Championship match. While he was doing that, Marty Scurll attacked Ospreay with his umbrella. Mysterio tried to make the save, but Scurll ripped his mask off. Liger then came back in and ran Scurll off. No date for Mysterio's first NJPW match has been announced, but the promotion is returning to the United States on July 7th for a show at the Cow Palace in San Francisco. Mysterio and Ospreay have faced each other once before, with Ospreay defeating him in What Culture Pro Wrestling's (now Defiant Wrestling) World Cup last summer. Mysterio vs. Liger was supposed to be their second meeting after Liger got the win at Starrcade 1996. Mysterio has been out of action since suffering a grade one partially torn left bicep during a match for Northeast Wrestling on March 2nd. He was scheduled to go to Birmingham, Alabama last week to have the injury evaluated by WWE doctors ahead of a potential return to the company.